Create a warm and welcoming bedroom with this sleigh panel bed. It features a Tobacco finish over maple birch solids and other veneers. 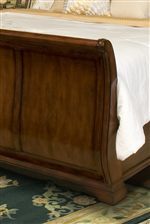 A traditional curved sleigh headboard and footboard features three panels to create a nice visual appeal. It comes with a hook rail and four support slats with one center leg. This bed is available in Queen, King and California King sizes. The Whitley Court Queen Sleigh Panel Bed by New Classic at Michael's Furniture Warehouse in the San Fernando & Los Angeles area. Product availability may vary. Contact us for the most current availability on this product. 00-002-320 Queen Footboard 1 68" 9" 37"
00-002-310 Queen Headboard 1 68" 13" 60"
Handles & Hardware Antique brass finished hardware knobs. Case Detail Carved bracket feet. Drawer / Shelf Construction 5 piece drawer box. 4 corner English dovetail with separate drawer front. Case Construction FSC certified maple birch solids and other veneers. Whitley Court will bring a traditional and warm look to your master bedroom. Each piece is finely crafted using maple birch solids and other veneers in a warm Tobacco finish. All drawers features full extension drawer glides for smooth and operating drawers and English dovetail construction for durability. 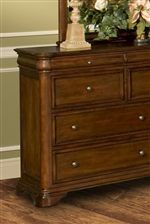 Felt lined top drawers are featured on the dresser, nightstand and chest to protect valuable items. A traditional sleigh bed is featured in Queen, King and California King sizes that will create a beautiful focal point in your bedroom. And lastly, each case piece features antique brass finished hardware and carved bracket feet to create a classic design. Find comfort and beauty in the Whitley Court bedroom collection. The Whitley Court collection is a great option if you are looking for Traditional furniture in the San Fernando & Los Angeles area. Browse other items in the Whitley Court collection from Michael's Furniture Warehouse in the San Fernando & Los Angeles area.